Confession- I love tuna but rarely cook it. And by rarely I mean I think I have cooked it like twice. I am not sure why it intimidates me but it does. Well, my dad made this tuna for me this weekend while I was home visiting and it was amazing. It made me realize tuna is so easy to cook and I should cook with it more often. It only takes a few minutes to cook and it is so tasty. 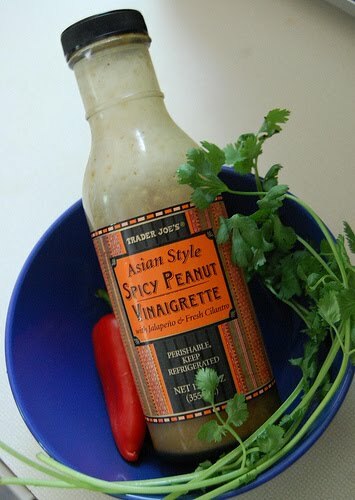 We didn't have all the ingredients to make the dipping sauce, so we instead used Trader Joe's Spicy Peanut Dressing which was excellent with the tuna. This dressing is seriously delish, I think it would be great on any meat or a salad. I highly recommend, another great Trader Joes buy. Next time I make the tuna though I will definitely be making the Ginger-Carrot dressing. I think the flavors would pair well with the tuna. Also I won't cook my tuna quite as long as my dad did. He cooked it several minutes per side and it was more done than I like my tuna- but you know how rents can be about their meat. The tuna really just needs to be seared if you buy Sashami grade. This was a super easy meal for a weeknight meal. Enjoy! Make the dipping sauce: Combine mirin, miso, ginger, carrot juice, orange juice, soy sauce, vinegar, red-pepper flakes, and sesame oil in a small bowl, whisking until miso dissolves. Sprinkle with sliced scallion. 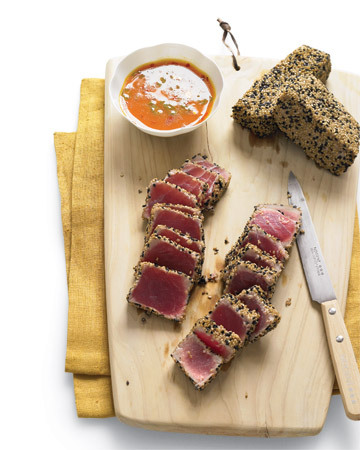 Make the tuna: Combine sesame seeds in a shallow dish. Press tuna pieces into seeds, turning to coat each side. Heat oil in a medium saute pan over medium-high heat. Add tuna, and cook each side until white seeds are golden, about 20 seconds per side. Transfer tuna to a paper-towel-lined plate for 1 minute, then cut each piece into 1/4-inch-thick slices. Serve with dipping sauce. Side Note- I did not write this whole post in capital letters or in bold. My blogger is being so wonky this morning! and I am too tired and computer illiterate to figure it out! I love tuna too! I don't think I have ever made it. I usually let hubs just grill it. But this? I am def going to try. Looks delish!!!! This looks absolutely FABULOUS. I am obsessed with tuna. Definitely my favorite fish. I am loving the asian inspired dishes lately. I must say. Our new city FINALLY has a Trader Joe's so I will be able to pick up the fabulous items that you always brag about. ha, i hate when blogger misbehaves. This looks so yummy! Thanks for sharing! My hubby would LOVE this! I love tuna steak too and order it almost every time it's on the menu. I rarely cook it b/c it intimidates me too. It's so easy though! This looks amazing. I am definitely going to try! Thanks for sharing. Ooh this looks absolutely amazing. Thanks for sharing it! I am in dire need celine outlet shop of a new bag, and celine bag with summer literally knocking Celine Luggage Tote on our door, I'm going to need a good tote for the pool, beach and general carrying (don't you find yourself lugging more stuff around in the summer? )#). I mentioned Deux Lux before, when Oprah put one of their bags on her Favorite Things list. Well lucky me, I ended up getting that Celine Luggage bags bag for Christmas and I love it. It's sturdy, roomy and fun. So when I stumbled on the line's Celine Boston Bag beach totes, I was excited at the prospect of having a little sparkle with me at the beach. To my unbelievably mulberry bags wonderful mother, my awesome mulberry outlet granny, all of mulberry factory shop my hilarious aunts, my friends who are mothers and to all of my friends' fabulous moms... Happy Mother's Day. I honestly don't know Mulberry Bayswater Bags how you girls do it, because at 28 it's hard enough for me to make sure that I'm keeping MY mulberry handbags head on straight let alone be the one responsible for shaping the life alexa bag mulberry of another person. The past few Roger Vivier Flats weeks have been a non-stop shopping roger vivier spree to update roger vivier shoes my spring and summer wardrobe. Because of this, the next few posts will be dedicated to the purchases Roger Vivier Pumps I have recently made. My first feature will be on my newfound love of mesh or crochet sweaters this season. This type of piece is a great investment because it can Roger Vivier Sandals be used for every roger vivier sale warm-weather occasion. Whether it's as a cozy cover-up for late afternoons on the beach or dressed up with a pleated mini, it works every time.